I’ve been itching to make a review for this Japanese restaurant in Auckland but whenever we dine there I just don’t have a proper camera with me. But today I’ve decided to do it after having a really nice meal even if I don’t have my DSLR with me. So for this post I had used my phones tiny sensor camera which that explains the quality of the photos. Anyways even the photos don’t do justice I guess to have to read on as this is our favourite Japanese restaurant here in Auckland. Why? because the food is good, affordable and we love the service and ambiance. 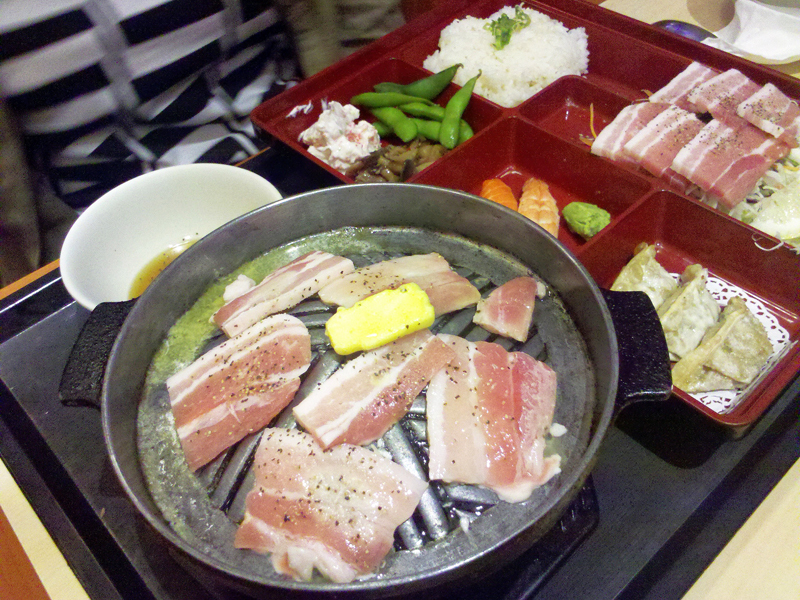 When we are lazy to do some home cooking we dine outside and Naritas would be our first choice, we love Japanese food. Sometimes there are occasional McDonalds or Burger Kings but that only happens when we are far away from home. 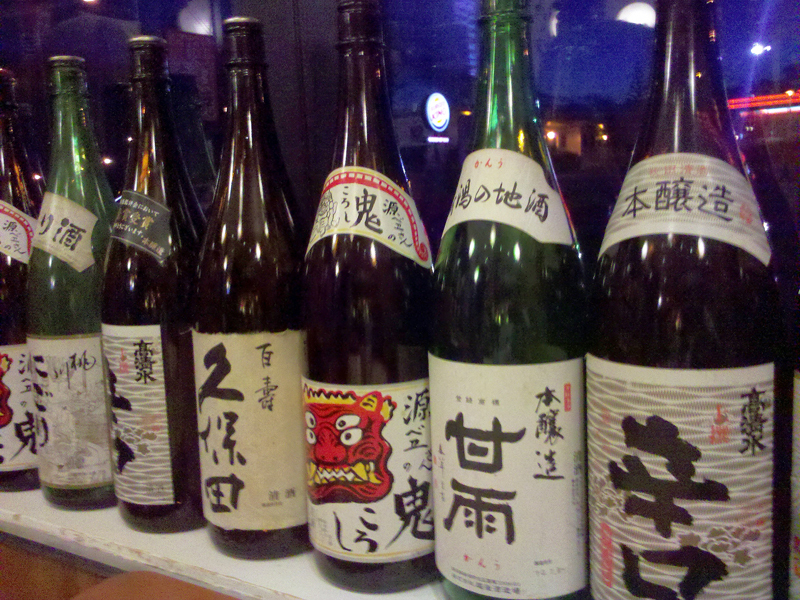 Naritas is so close to where we are so it’s really easy for us to satisfy that Japanese craving if need be. Our first option when we order at Naritas is their bento box selection as it comes complete with everything, usually during dinner it costs in between $20 to $25 and its $5 to $7 cheaper during lunch time depending on your order. I don’t have photos of all of their bento boxes but here is what we had on our last dining experience with them. They initially served us the miso soup, edamame, tea which I think is a genmaicha and the side dishes that came with the bento boxes. 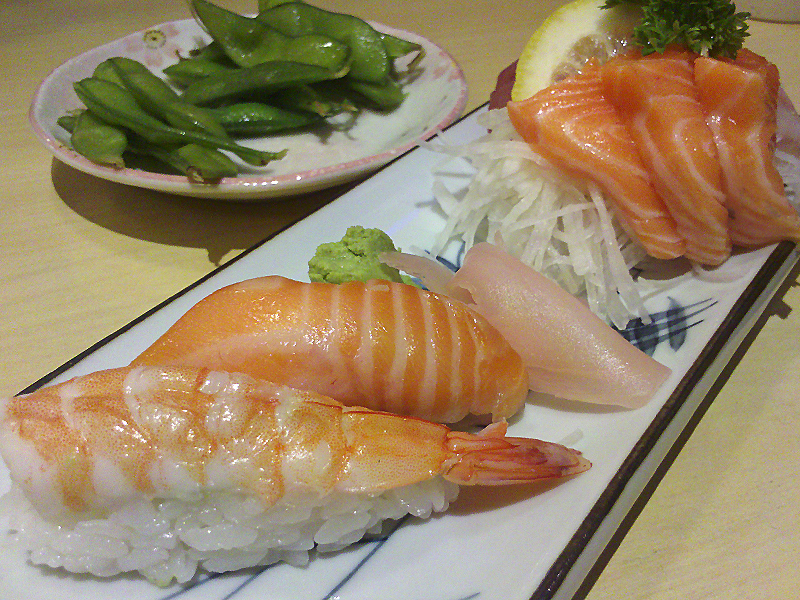 For the sides it was a mixed selection of sushi and sashimi and in one plate are two pieces nigirizushi one is prawn and another one is salmon. The rice is perfectly seasoned and the amount of wasabi was just perfect, on the same plate there we 9 pieces sashimi which consists of 3 salmon sashimi, 3 snapper sashimi and 3 tuna sashimi placed in a bed of daikon salad (The salmon slices were huge it covered the two other types on the photo). All of the fish tastes so fresh so the gari is not really needed as it does not have any fishy after taste. Now let’s go to the boxes, First up is the Beef Teriyaki bento and it contains a rice topped with beef teriyaki, mixed vegetable tempura, beef tonkatsu, a type of Japanese cabbage salad and some sort of cold marinated mushrooms. Everything was perfect in this plate, but the two that stood out was the beef which was perfectly cooked with the right amount of teriyaki sauce and the cold marinated mushrooms which tasted really good. Tempura was so crispy and not oily, it so good I did not even realized that it’s made out of vegetables and there was not shrimp in there. 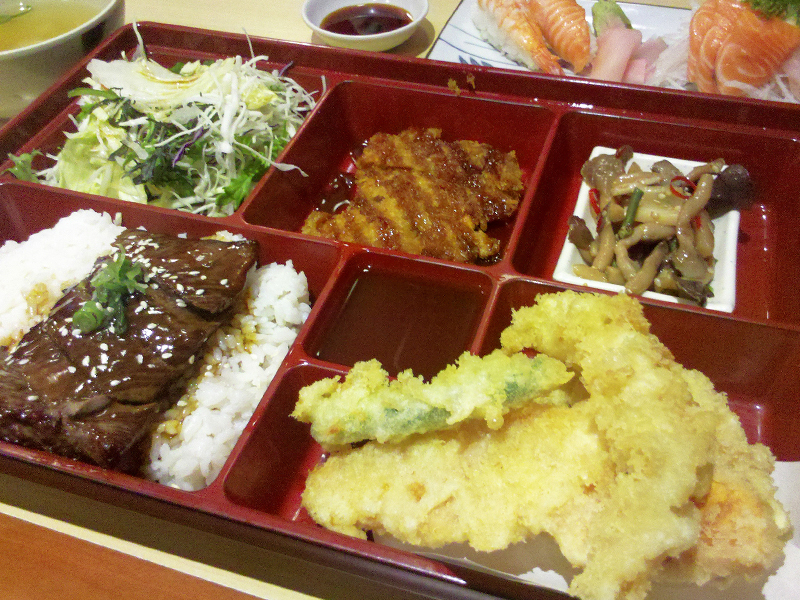 My wife did order the grill your own bento box, I forgot what it is called but you can see from the photo how it looks. The box contains a good amount of thinly sliced pork which is served with butter and seasoned sesame oil, 3 pieces gyoza, prawn nigirizushi, salmon nigirizushi, edamame, marinated mushrooms, crab salad, rice and a good amount of cabbage salad hidden beneath that raw pork belly. It was a hefty meal and my wife asked for help in finishing it so I got a chance to try her order. The pork was phenomenal and it goes well with rice, it’s so rich in flavour thanks to the seasoned sesame oil and the melting fat from the belly. I also loved the crab salad which I think I will order a full serving of this the next time we dine there. Like by bento everything was perfect. 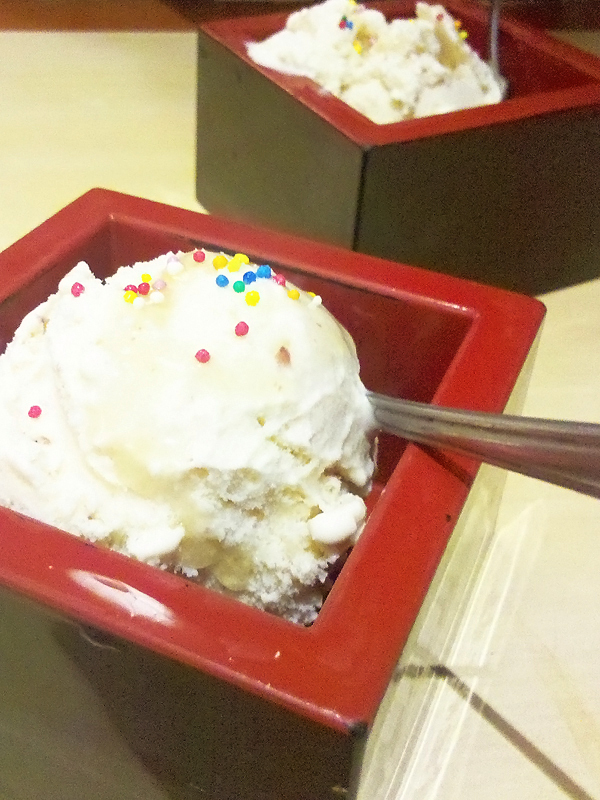 Finally ice cream was served; it came with the bento meal as well. At first we were expecting green tea ice cream but what was served is a normal vanilla ice cream, sort of disappointed here but what would you expect from a free desert? I guess our expectation was high as we compared it to a more expensive set meal for two which we tried several months ago and we have a choice of Asian flavoured ice cream and green tea was one of the flavours. Anyways it’s still a good way to end a meal and if that’s not enough they have candy bar just beside the cashier where you can get as many gummy candies you want (we never thought this was free before). Photos turned out great and this looks like some yummy eats. As funny as this may seem my iphone takes some awesome photos and sometimes I prefer these photos to my standard camera. I like to travel light! What a good address to have! Have loved bento boxes since we first made aquintance many moons ago! Another one to > Auckland friends! I went to the Takapuna Naritas many years ago and was blow away with the amount of food we received. We couldn’t fit it all on the table! Did you also struggle to fit everything at your table? Delicious! That fish all looks so fresh.